There is no doubt that San Daniele del Friuli is known for its famous prosciutto ham, but it is worth a visit also to discover its typical local dishes, from which the traditional osteria selects the most characteristic apects of the traditions of winemaking and cuisine in Friuli. Among these taverns, the Osteria La Pergola is without a doubt worth a visit, it is a typical osteria, which, in winter receives its guests in the warmth of a cosy room warmed by a typical "Fogolar", while in summer it hosts them in a cool porch and a magnificent terrace where you can enjoy traditional Friuli dishes offered by the Osteria, accompanied and it could not be otherwise, by beautiful and fragrant wines from the best wineries in Friuli. To accompany the wines from our cellar, it would be unforgivable not to try the tasting menu based on prosciutto di San Daniele, accompanied by fresh goat cheese, which is served along with delicious homemade spreads, or accompanied by rich vegetable pates, prepared in house. The wine-menu has a particular focus on the wines of the region and favours quality wines from small, emerging wineries, but for those who wish, you can also taste wines selected from the best national and international labels: our cellar offers wine lovers a wide assortment of wines from other Italian regions and even the best wines from France. 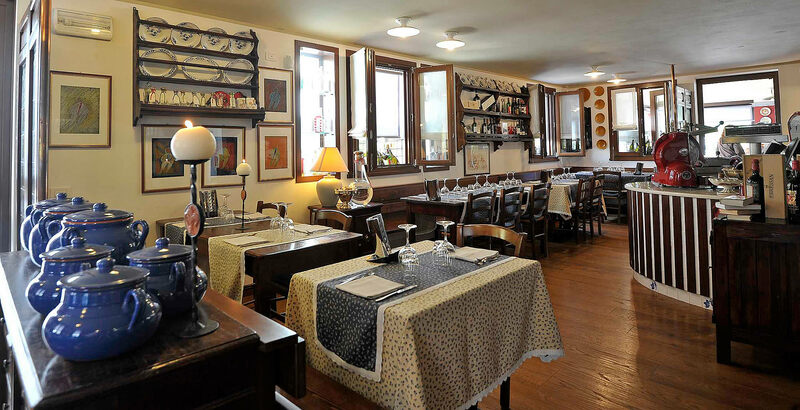 A visit to our Osteria is also an opportunity, after drinking even just a simple aperitif accompanied by a slice of bread, to terminate your visit to San Daniele with a dinner in our restaurant, to end it on a high note.